Check out what the participants of the Inspired by Reading Book Club made for August's book, "The Infinities" by John Banville. Making a locket picture last is easy with resin. Have you tried Chinese knotting yet? Carmi has a wonderful tutorial on her blog this week! 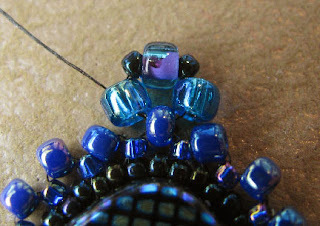 Jean's teaser post for Beads & Baubles and what she received from the store to design with is pretty dramatic! See her blog! Combine shells, bamboo beads, and hemp for this unisex necklace design. 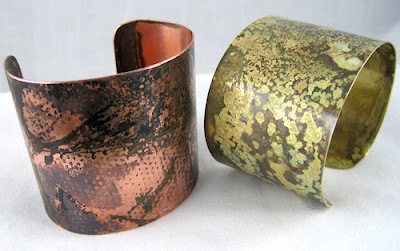 Rena Klingenberg shares her tutorial to make these gorgeous cuffs! 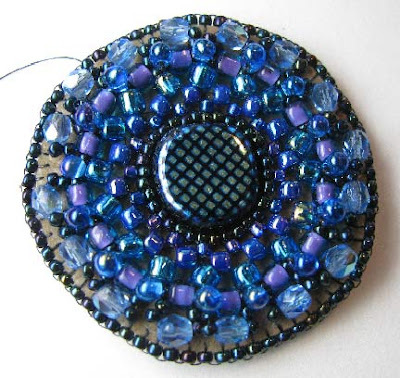 For inspiration and tips, don't miss these talented artists who have previously shared their work on Beading Arts! Since metal isn't my primary thing, I always feel that I need to supplement what I share with you during Metal Month! Here are some gorgeous projects that I've been collecting from all over the web, along with great instructions to go with them. I chose to play with right angle weave (RAW) to make my August piece for the Bead Journal Project. RAW has never been my favorite stitch , but it does work really well in the round, so it would have been pretty silly to skip it! It took multiple tries to get the bead count right in each round, but once I had it worked out, the piece came together quickly and easily. I'm 99% sure that I will be using this stitch again in an upcoming embroidered project. 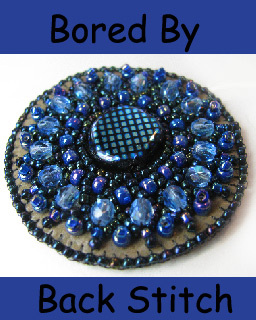 It is a very useful as a filler, and is easy to convert from beadweaving stitch to embroidery stitch. 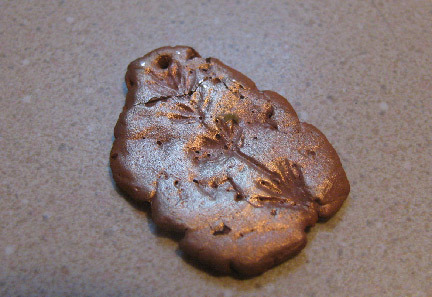 A simple resin bird mold becomes a wonderful piece of jewelry. 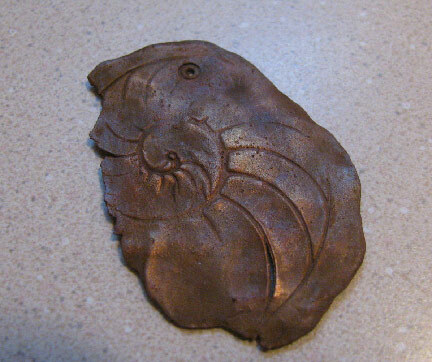 Jean shares a great free guide to etching jewelry by Jewelry Making Daily ! It is great! Say good-bye to summer but not your flip flops with this fun flip flop earring tutorial. 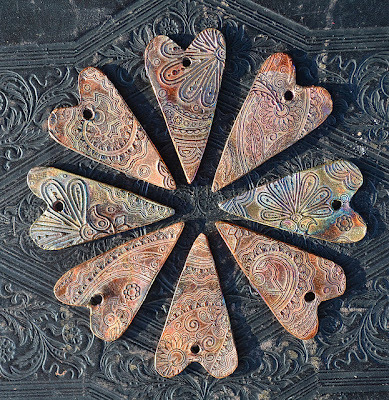 Check out Brandi's colour palettes drawn from ceramic beads from Pajego Art House - yum! My friend Christine Ritchey took one look at my miserable pieces from the Tuesday post and promptly sent me some more suggestions for what could have gone wrong. Aren't friends wonderful?! First, it's refreshing to see someone posting failures! Heaven knows, we all have them. Here're are some thoughts, although you've probably thought of them yourself. Chris, you're such a sweetie! Thank you for your ideas. I did NOT use distilled water, but it was highly filtered. Still...hmmm... 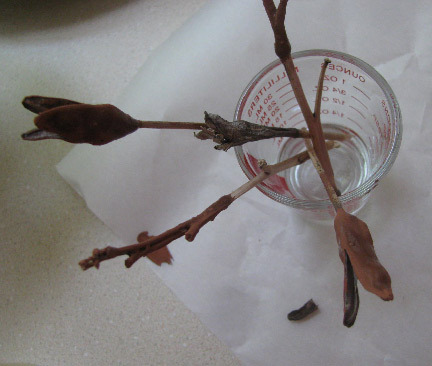 The twigs and pods were bone dry, but that's a good thing for me to mention to readers anyway, and I forgot. 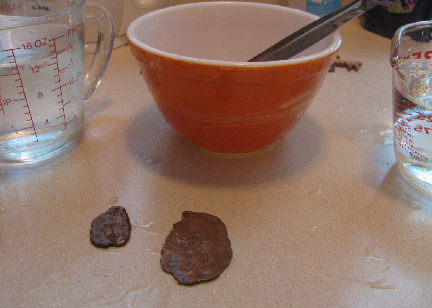 I think the major problem was two-fold: the clay was not reconstituted quite fully, with little tiny lumps of hard stuff still in the mix, and I also don't think I did enough layers. I'm going to post your comment as a follow-up, so I thank you for pointing out those additional things that I missed! I think it's important to occasionally show failures...many of my readers are beginners, so I want them to know that we all have our days! If you're still looking for inspiration, don't forget about these fabulous artists that have shared their work with us over the years! If you love flowers, you must get this book. Learn-as-you-go style makes metal seem possible to tackle. 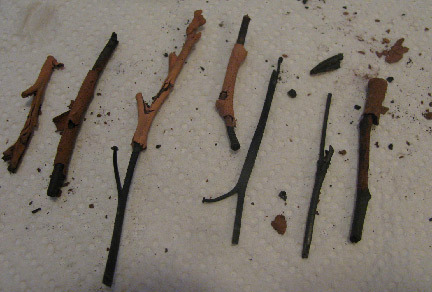 I collected some twigs and pods from around my house to do one of my CopprClay experiments. 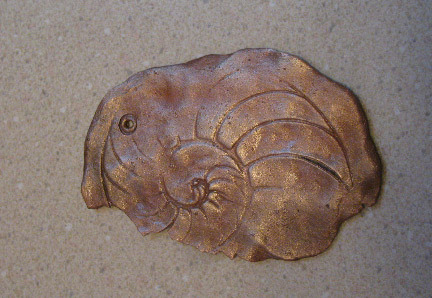 If you've been following along with me, you know that I actually had some success at reconstituting some old clay and forming new pieces, firing them, and finishing them with a lovely LOS patina. Now for the ones that didn't work out so well! 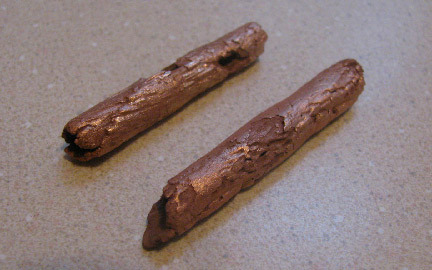 I gave each of the twigs and pods coating after coating of copper slurry "paint", allowing each coat to dry. I propped up and hung them between coats. 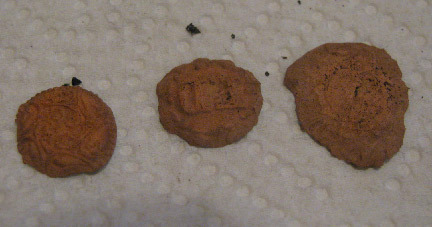 Before firing, I baked them at 200 F in my oven just to make extra extra sure that everything was dry. Every one of them crumbled, broke, flaked, and crunched away. The problem is that I can't tell you which of two possible problems was the ultimate cause of the failure. 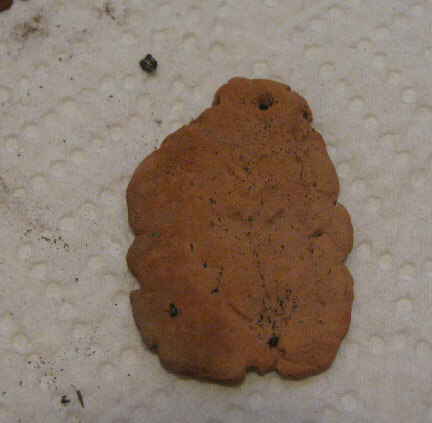 The clay was old and reconstituted, so as you may have noted on my other pieces (the ones that actually succeeded), there were lots of rough spots and air bubbles. 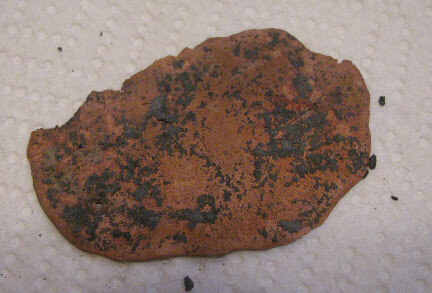 The second possibility is that I simply didn't add enough layers of the clay. 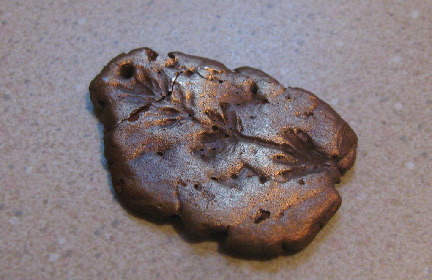 I've done this before with PMC silver clay and Art Silver clay with no problems, so my instinct is that it was probably the unevenness of the reconstituted clay. But we'll never know for sure, huh? Ok, so I've made some new pieces, mostly from reconstituted CopprClay, I've fired them, and now I'm ready to give them a nice finish. 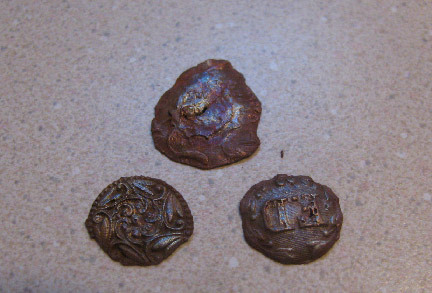 All of these pieces are going to be wire brushed and then treated with a simple patina solution. 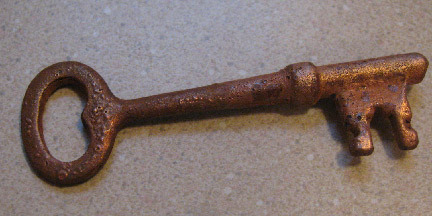 If I wanted a shiny finish, I would have followed up the brass wire brush with a red rouge polish instead. You'll find more information on finishing pieces at my prior post, but I'm going to be using the same basic method here. 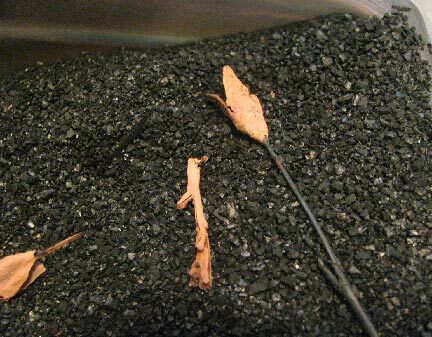 The pieces come out of the kiln with no luster at all. 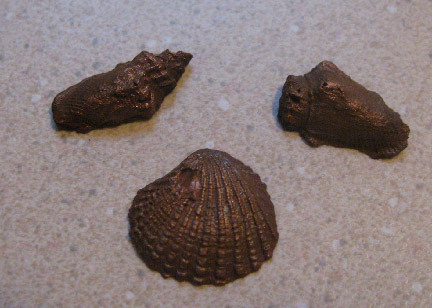 If they've been fired properly, the metal in the metal clay mixture has sintered and formed a solid metal pieces. Impurities, moisture, and chemical reactions may get in the way of that. 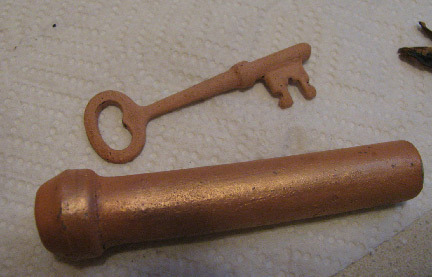 But if all is well, you can get a wonderful shiny finish, though not mirror bright, with just a simple brass brush. I use a few drops of dish soap as well, to remove the charcoal residue while I'm brushing. 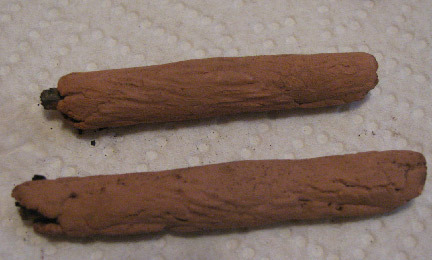 The shot above shows one piece brushed and one unbrushed. Can you tell which is which? 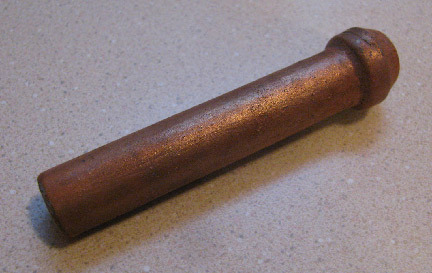 My next step was to use a patina solution. 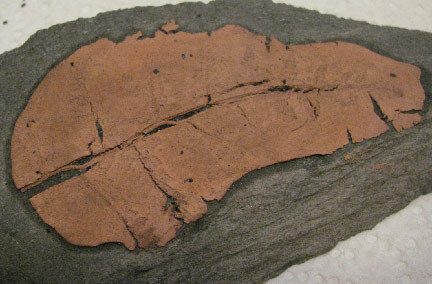 The liver of sulfur formula I used was provided by Katherine Palochak on Ganoksin. Follow her directions, using the three bowls and setting up your dipping stations as instructed. 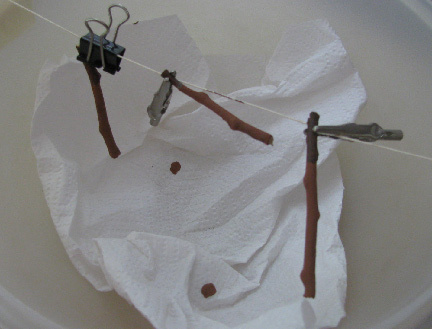 I use the formula of 2 c hot water, a small piece of LOS, 1 T ammonia, and 1 t salt. See the crack across the top of the lavender-impressed charm? Yes, it did end up cracking a few days later :-( But stay tuned for pictures from the truly Epic Fail that I'll be showing you tomorrow! 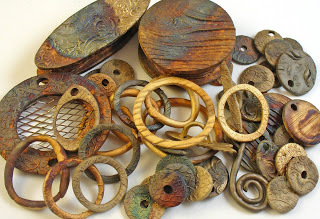 Check out Erin's big news - she will be presenting a webinar on Fibre Findings and Finishing Techniques for Jewelry for Interweave/FW Media! Do you have a charm bracelet? Wear it again as a necklace! 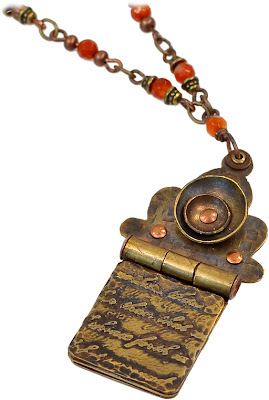 A vintage Parisian frame and a very old dried flower makes this new resin filled object special. 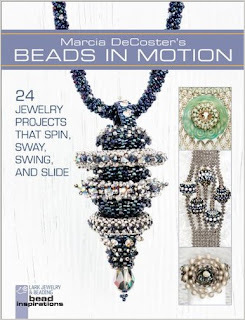 Jean reviews the 10th Anniversary Collector's Issue of Bead Style Magazine and it is GREAT! Andrew was (subconsciously) inspired by the color palette of his shirt when working on this brick stitch bracelet. 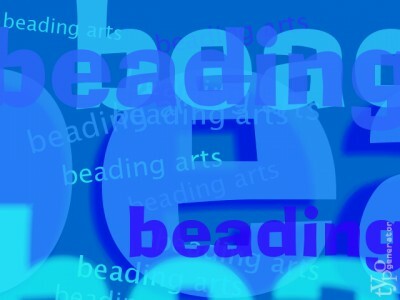 It's new product sharing day on A Bead A Day blog! It's all about stainless steel findings. 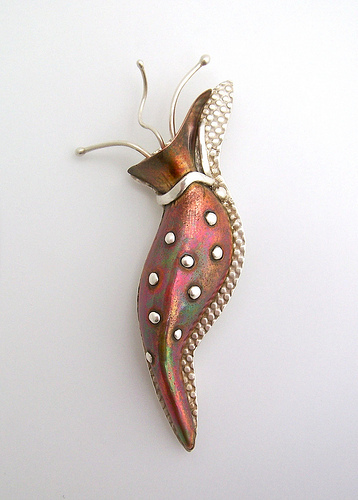 There is still time for some summer time earrings. 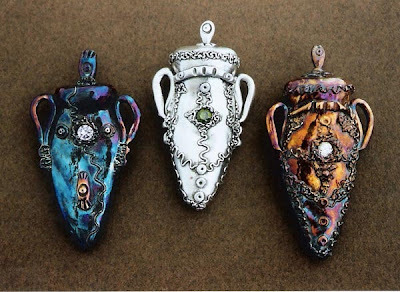 Nothing like some beautiful eye-candy to inspire you to dive into working with metal clay! These pieces are not part of any tutorials that I know of, so please respect the artists' rights and be inspired by them only. 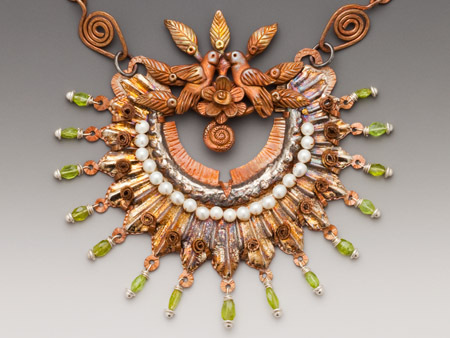 Artist and instructor Sherri Haab demonstrates metal clay’s remarkable versatility, showing how it can be textured, molded, carved, and sculpted to create gorgeous beads. 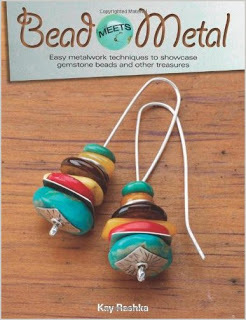 Packed with color photos showing each step of working with metal clay. Covers more than just beads, but has lots of techniques that can be used in making beads. Disclaimer: one of my projects is in this book, so of course I'm biased. 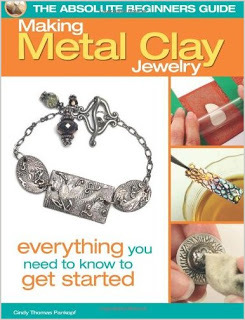 I also think it is an excellent beginner's book which will answer practically any question you have about working with low-fire silver clay...a huge bonus if you don't have a kiln! Not for beginners! The next new big thing? The most gorgeous advanced work you'll ever see. My new favorite beginner's guide. Love it. 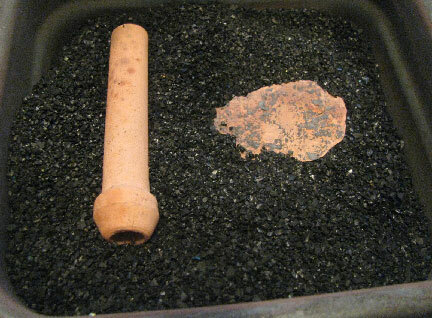 The missing element for metal clay...up till now! 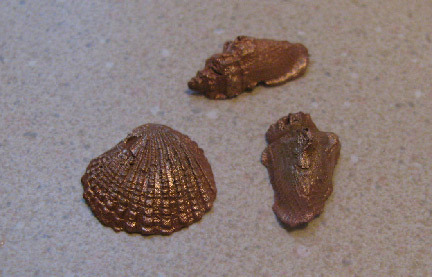 Irina's favorite projects in metal clay. 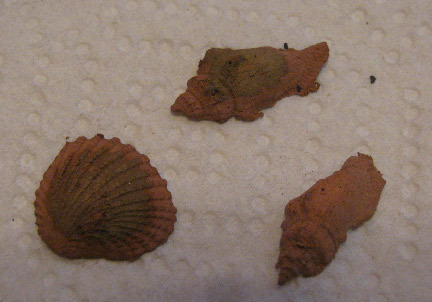 Yesterday, I showed you my most recent attempts to use reconstituted CopprClay to make some new pieces. 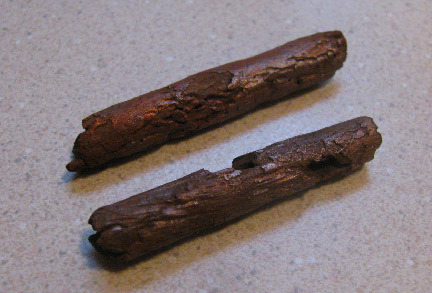 Once they dried out completely, I placed them in a 200 F oven for about 20 minutes just to make sure they were all bone dry. Then it was into the kiln. 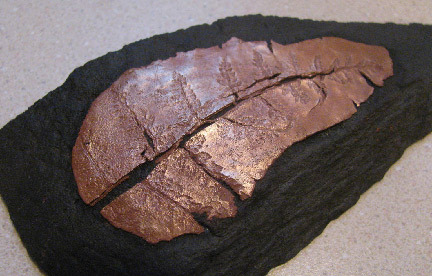 I've got more information on firing copper clay at this link. 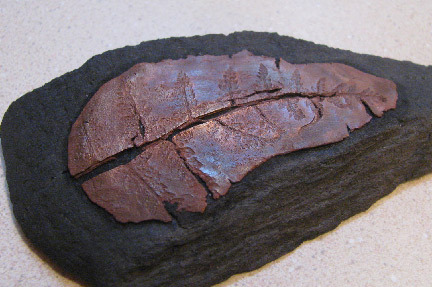 It must be buried in a pan of activated charcoal to avoid oxidizing when it's fired. The picture above shows you only one layer of pieces...all of the pieces I made fit into one firing by layering them with charcoal. I fired them at 1700 F for a little over three hours, and then ramped them back down over another hour, leaving them to finish cooling overnight. 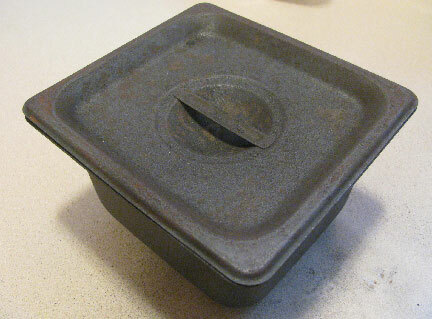 It says a lot for my kiln that in the morning, the pan was still hot! Not enough to burn, but certainly enough to notice. 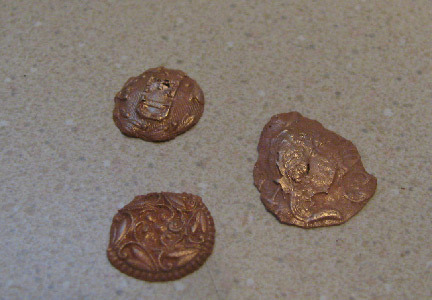 Here are the pieces that emerged. You'll see that they are all dirty looking, and have no shine to them at all. Just wait until they're finished properly...it makes all the difference! You'll also maybe notice that there are a few pieces missing from the shot yesterday. Oh yeah...there was an epic fail (or two or three) to tell you about later!